The aji is one of the most popular fish. It is the maaji which is often seen especially in Kochi. It is at the fresh fish corner of a supermarket mostly. It is the fish that anyone has eaten at once. The signal which thought that I would investigate about the maaji is lure fishing of the maaji which went together with my friends. Although I was interested in the fish from before, the fish which can be easily fished using bait called the aji did not have interest in particular. 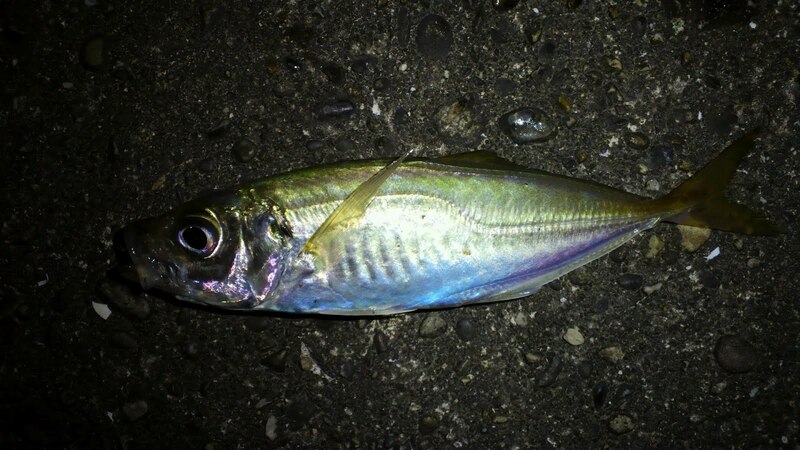 However, when I began fishing using lure, unlike bait, I was not able to fish the aji easily. Therefore, I wanted to understand the aji more and investigated about the ecology, the habit, etc. of the aji this time. The scientific name of the maaji is “Trachurus japonicas”. The maaji is lone of the kinds included in “Perciforbes-Carangidae-Trachurus”. Many maajis ranging the south Japan except Okinawa and the East China Sea. They crowd together and inhabit the reef region with the depth of 1~150 meter. The maaji ride on a warm current around January, and go north. And they go south around autumn. “Kiaji” and “Kuroaji” of two kinds are mainly in the maaji. The kiaji establish on the coast and live. They establish to the reef the coral reef and the sandy mud bottom which are on the coast. The kuroaji migratory offshore and live. The feeding habits of the aji are carnivorousness and eat the zooplankton, small fish, the crustacean, shellfish, the cephalopoda and the polychaete etc. Since the inside of the stomach of the aji will be empty in one day, they take food every day. Their natural enemies are birds and large-sized carnivorous fishes beside humans. The body color of maaji can defend themselves from such a natural enemies. Moreover, they have the character to flock to light. And they flock in quest of the strength of the most suitable light. However, the strength of the suitable light changes with environmental conditions at that time. The maaji are mainly used for food. How to eat is various and especially sashimi, the broiled with salt and the dried fish are delicious. DHA which activates the brain and EPA which lowers cholesterol are abundantly contained in the aji. Moreover, they are used as bait when fishing a cuttlefish and a flatfish, or are treated as the object fish of fishing. It is in how to fish the aji variously, and there are mainly “sabiki fishing” and “lure fishing”. We can be seen the aji mostly in the whole sea in Kochi Prefecture. In the sea near Kochi University, we can be seen they to Urado bay and Usa bay etc. The best season is from August to March. I want to catch it. My target is fishing 40-cm .